Mezcal Tasting With Tacos And Chocolate Pairings! You must be a member of the Guadalajara Wine Tasting Group to attend this activity. Would you like to join this group? Join us for a very special Mezcal tasting presented by Protected content in partnership with Mezonte Mezcales. 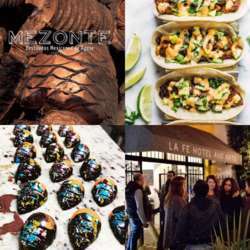 Mezonte works with master artisanal Mezcal producers all over Mexico to produce high-quality mezcales using traditional (as opposed to industrial) techniques and processes. During the event, we will learn about the Mezcal production process, and taste three mezcales from three different Mexican states (Jalisco, Michoacán, and Oaxaca). Each mezcal will be paired with a taco tasting (featuring guisados de carne highlighting the culinary culture of each of the three states). As well, each mezcal will be paired with a gourmet chocolate created specially by master pastry chef Irving Leija to highlight the unique flavour profiles of the three mezcales. As well, participants will have the opportunity to view and learn about the current art exhibition at Protected content The exhibition Mexican Women: Strength and Fragility features 39 works by 18 female artists from diverse regions of Mexico. Through painting, drawing, illustration, and photography, these artists offer their unique perspectives on what it means to be female in modern Mexico. In these works, we see a juxtaposition of themes of empowerment, strength, passion, spirituality, and sensuality alongside issues of vulnerability, loneliness, conflict, and ongoing struggles against maltreatment. Unifying these multiple perspectives is a powerful creative spirit that exists in the hearts of all our nations’ women. Artworks are available for purchase, and anyone who purchases an artwork during the event will have $250 deducted from the cost of the artwork.